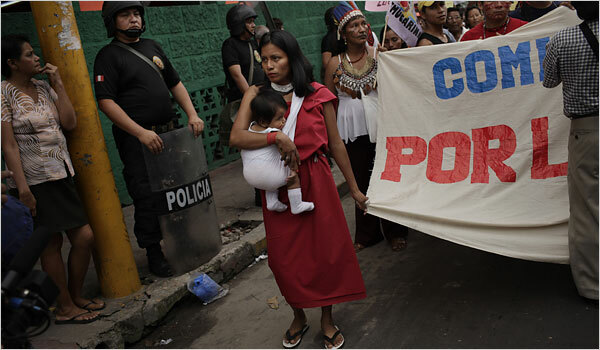 IQUITOS, Peru -- Faced with a simmering crisis over dozens of deaths in the quelling of indigenous protests last week, Peru's Congress this week suspended the decrees that had set off the protests over plans to open large parts of the Peruvian Amazon to investment. Senior officials said they hoped this would calm nerves and ease the way for oil drillers and loggers to pursue their projects. But instead, indigenous groups are digging in for a protracted fight, revealing an increasingly well-organized movement that could be a tinderbox for President Alan García. The movement appears to be fueled by a deep popular resistance to the government's policies, which focused on luring foreign investment, while parts of the Peruvian Amazon have been left behind. The broadening influence of the indigenous movement was on display Thursday in a general strike that drew thousands of protesters here to the streets of Iquitos, the largest Peruvian city in the Amazon, and to cities and towns elsewhere in jungle areas. Protests over Mr. García's handling of the violence in the northern Bagua Province last Friday also took place in highland regions like Puno, near the Bolivian border, and in Lima and Arequipa on the Pacific coast. "The government made the situation worse with its condescending depiction of us as gangs of savages in the forest," said Wagner Musoline Acho, 24, an Awajún Indian and an indigenous leader. "They think we can be tricked by a maneuver like suspending a couple of decrees for a few weeks and then reintroducing them, and they are wrong." The protesters' immediate threat -- to cut the supply of oil and natural gas to Lima, the capital -- seems to have subsided, with protesters partly withdrawing from their occupation of oil installations in the jungle. But as anger festers, indigenous leaders here said they could easily try to shut down energy installations again to exert pressure on Mr. García. Another wave of protests appears likely because indigenous groups are demanding that the decrees be repealed and not just suspended. The decrees would open large jungle areas to investment and allow companies to bypass indigenous groups to obtain permits for petroleum exploration, logging and building hydroelectric dams. A stopgap attempt to halt earlier indigenous protests in the Amazon last August failed to prevent them from being reinitiated more forcefully in April. The authorities said that nine civilians were killed in the clashes that took place last Friday on a remote highway in Bagua. But witnesses and relatives of missing protesters contend that the authorities are covering up details of the episode, and that more Indians died. Twenty-four police officers were killed on the highway and at an oil installation. Indigenous representatives say at least 25 civilians, and perhaps more, may have been killed, and some witnesses say that security forces dumped the bodies of protesters into a nearby river. At least three Indians who were wounded said they had been shot by police officers as they waited to talk with the authorities. "The government is trying to clean the blood off its hands by hiding the truth," said Andrés Huaynacari Etsam, 21, an Awajún student here who said that five of his relatives had been killed on June 5 and that three were missing. Senior government officials repudiate such claims. "There is a game of political interests taking place in which some are trying to exaggerate the losses of life for their own gain," said Foreign Minister José García Belaunde. He said the ultimate aim of the protesters was to prevent Peru from carrying out a trade agreement with the United States, because one of the most contentious of the decrees that were suspended on Thursday would bring Peru's rules for investment in jungle areas into line with the trade agreement. "But," Mr. García Belaunde insisted, "the agreement is not in danger." Still, the government's initial response to the violence seems to have heightened resentment. A television commercial by the Interior Ministrycontained graphic images of the bodies of some police officers who were killed while being held hostage by protesters. The commercial said that the killings were proof of the "ferocity and savagery" of indigenous activists, but an uproar over that depiction forced the government to try to withdraw the commercial. The authorities are struggling to understand a movement that is crystallizing in the Peruvian Amazon among more than 50 indigenous groups. They include about 300,000 people, accounting for only about 1 percent of Peru's population, but they live in strategically important and resource-rich locations, which are scattered throughout jungle areas that account for nearly two-thirds of Peru's territory. So far, alliances have proved elusive between Indians in the Amazon and indigenous groups in highland areas, ruling out, for now, the kind of broad indigenous protest movements that helped oust governments in neighboring Ecuador and Bolivia earlier in the decade. In contrast to some earlier efforts to organize indigenous groups, the leaders of this new movement are themselves indigenous, and not white or mestizo urban intellectuals. They are well organized and use a web of radio stations to exchange information across the jungle. After one prominent leader, Alberto Pizango, was granted asylum in Nicaragua this week, others quickly emerged to articulate demands. "There has been nothing comparable in all my years here in terms of the growth of political consciousness among indigenous groups," said the Rev. Joaquín García, 70, a priest from Spain who arrived in Iquitos 41 years ago and directs the Center of Theological Studies of the Amazon, which focuses on indigenous issues. "At issue now," he said, "is what they decide to do with the newfound bargaining power in their hands."